I’m not your average blogger. I’ve been at it a long time. I tend to experiment and try different techniques both recommend and not recommended. I can’t say I’m the most successful blogger, but I do have a lot of experience. I’ve been trying to improve my blog, trying to emphasize the positive, trying to make it an asset and one of the things I did to that end was completely overall my WordPress taxonomy. When I did this I went back and re-tagged all my old posts. I also wrote custom excerpts and added a feature image. I did a pile of editing of the actual text and once again in 2019 I’m undertaking a massive effort to improve old blog posts through editing, tagging, linking and search engine optimization. I have ten or twelve posts that get the majority of the page views month in and month out. I’m now trying to direct traffic to my best posts, what Yoast would call “cornerstone content”. Another word you could use for this content is “Greatest Hits”. I list a few in my sidebar. I’ve also overhauled my category achieves and tried to leverage them more in my search engine optimization efforts. My category archives I think used to get a lot of strange keyword referrals but I got rid of unflattering content and I also adjusted my sitemap, but the other thing I did was remove my tag cloud from the sidebar almost everywhere. I’m not sure where I got this advice but the idea is you emphasize your greatest hits and deemphasize random archives. Toast also advocates greater emphasis on category and tag archives as landing pages complete with custom text and code. They sometimes surprise as they are random but deterministic. Are Tag Clouds Good or Bad for SEO? Given Yoast’s emphasis on category archives you’d think they must help but I worry like blogrolls and other links in the sidebar search engines just ignore them, but not every design decision is made for search engines. 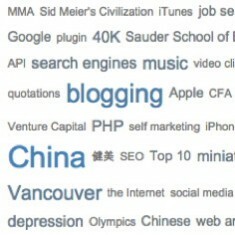 Having actual intelligent link text along with good UI/UX is what real people need and I honestly think the tag cloud looks cool, I often look at the one on my CFA® Flashcard blog. I’ve put way less work into tagging and optimizing that blog than this one, but people find it because it has good content and some keyword density. That blog is on WordPress.com and is very much barebones and uses the actual text from my actual handmade flashcards of which I’ve now typed out over one thousand. It doesn’t have optimized keyword stuffed marketing jargon. It probably doesn’t do as well as it could in search engines so I’m going to try linking to it more. Another reason I revised my WordPress theme and taxonomy was visual appeal. I’m a big fan of structured metadata and thus featured images. When used correctly they allow for improved social sharing and I definitely think they make the recommendations at the bottom of individual posts look better. I also rewrote a lot of post titles to be shorter and punchier. As shown above, every post has small textual links to my category archives. I click these and the recommendations but I’m not sure others click them much, this is something I could track better in Google Analytics. My blog does not do that well in most social networks, I’m not very viral, I tend to mostly share a post once on Twitter, but I do update and re-share old posts too. Twitter removed their share counts so now I look even less popular but there are a few popular posts on Muskblog, I suggest you start with the Greatest Hits but feel free to browse the category and tag archives. When I share stuff on Twitter now I’m starting to carefully choose a hashtag, before I often used them ironically but using them strategically can help you get retweets and increase your Klout. What do Experts say about Tag Clouds? Is the WordPress Tags Functionality Bad for SEO? Make sure and leave your opinion on tag clouds in the comments below. This entry was originaly posted on December 28th, 2015 , it was last edited on February 23rd, 2019 and is filed under: Marketing and tagged: Blogging, SEO, Taxonomy, Web Design, WordPress.